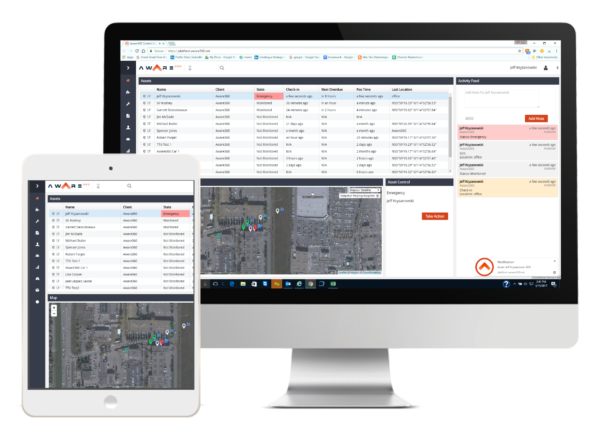 Calgary, Alberta, September 5, 2018 – Aware360 has released Control Center v.1.14 along with an updated version of the SafetyAware smartphone app focusing on usability enhancements and performance optimization. Through the Control Center, administrators and managers now have more options for review and assessment. Expanded capabilities now allow automated emails to be sent for any alert type. Managers can also assess and report on incidents and activities more easily. The ability to export an individual’s shift history provides a transcript that allows for evaluation as well as simplified audit compliance. The updated app is strengthening Aware360’s commitment to privacy and personal information. An individual’s user profile now displays optional fields that are not required for day-to-day use, letting workers choose what information to provide for emergency-related events. Feedback from users helped design these tools. The new SafetyAware features have been released as a software update pushed out to all customers. Aware360 understands people are the most important part of any workplace and provides the tools to ensure they will have help whenever it’s needed. Driven by our passion for people, Aware360 creates solutions to connect people with personal technology to those who care and can help. This ensures people are safe, especially when they are exposed to social, environmental or health risks. From workers in the most remote locations to delivery drivers in urban areas, we provide the technology and response network to ensure their safety anywhere in the world. That’s the power of PeopleIoT™ solutions. To learn more about Aware360 and our full solution suite visit www.aware360.com.